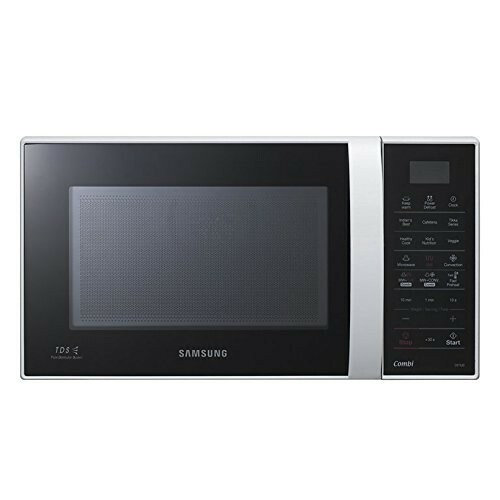 Samsung 21 L Convection Microwave Oven CE78JD Black has good features that facilitate easy cooking in any kitchen. It has ceramic enamel cavity that doesn’t require any types of careful attention. A ceramic enamel cavity is proven to be durable and scratch-free. Such types of oven cavity is naturally smooth and doesn’t require much cleaning works. You just need a damp cloth to remove any types of splatters. On the other hand the cavity walls are coated with anti-bacterial material. This Samsung CE78JD 21 liters convection microwave oven uses TDS (triple distribution technology) that throws three waves to cook any foods evenly at a faster speed than other normal microwaves. Whether you want to prepare pizza or you want to warm milk all can be handled by this triple distribution system very impressively. The TDS technology is also very helpful to provide evenly cooked meals without any doubts. Further, Samsung 21 liters convection microwave comes with auto menus that do the thinking for you. You don’t have to read a recipe book. Samsung’s auto menu feature delivers tasty food all the times for you. Since you are using your preferred auto menu so you don’t have to use your guesswork, you just need to select the menu and press the button to start cooking. This Samsung CE78JD microwave has defrosting capability that doesn’t take much time to defrost. Samsung’s high power defrosting feature lets you defrost frozen foods fast and evenly. Other important features are 21 liters capacity, 1200 watts of power consumption, LED display, bubble switch control method, handle based door, turntable microwave distribution, six power levels, 800 watts of output power, ceramic enamel cavity interior and 5 years of warranty.